Full disclosure: I don’t cook often. Don’t get me wrong, I like cooking. I think I make good meals when cooking actually happens in my kitchen. I just have a hard time planning, then having to grocery shop, and now with a baby it seems like I have even less time to devote to it. 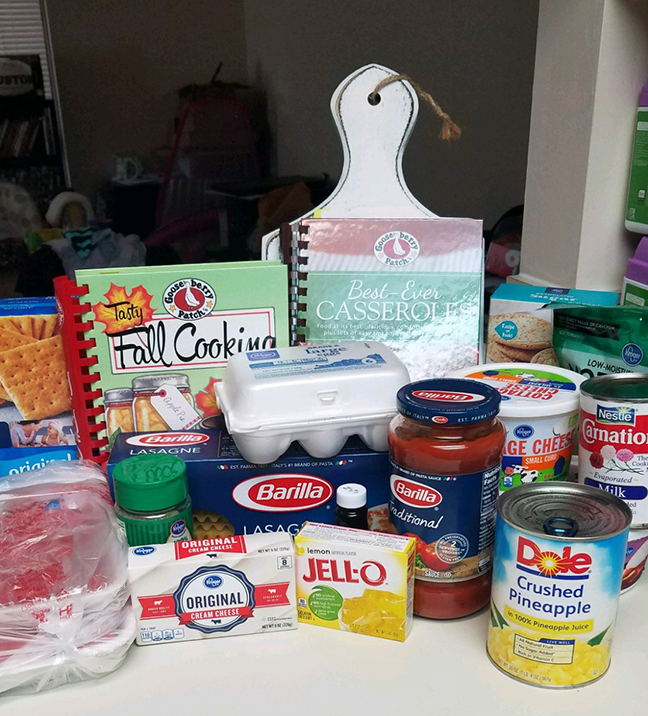 But when I saw that July 29, 2017 is National Lasagna Day, and July 30, 2017 is National Cheesecake Day, I had to look up some easy recipes to share with you! 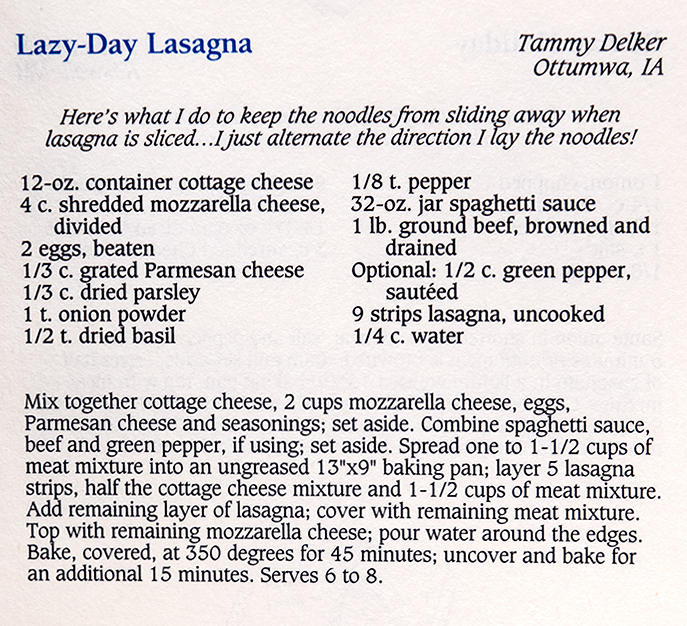 I found a great lasagna recipe called “Lazy-Day Lasagna” in Gooseberry Patch’s Best-Ever Casseroles cookbook. That title instantly got my attention because, well, I have my attention on about 9,038+ things at home, so a lazy recipe is excellent. Lasagna is also my husband’s favorite meal, so bonus points for me! Just as I was getting started with cooking the ground beef, Isabella woke up from her nap and wanted to help! Gordon Ramsey has nothing on this kid, ha! Anyone else have curious kids? 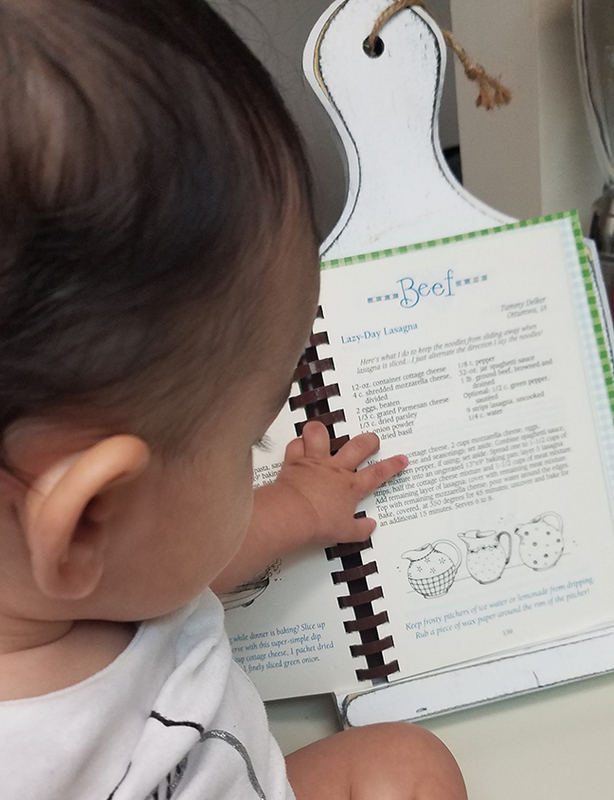 Is 9 months too early to start grooming her to be a chef?! The Lazy-Day Lasagna was a hit with my husband and an even bigger hit at work! 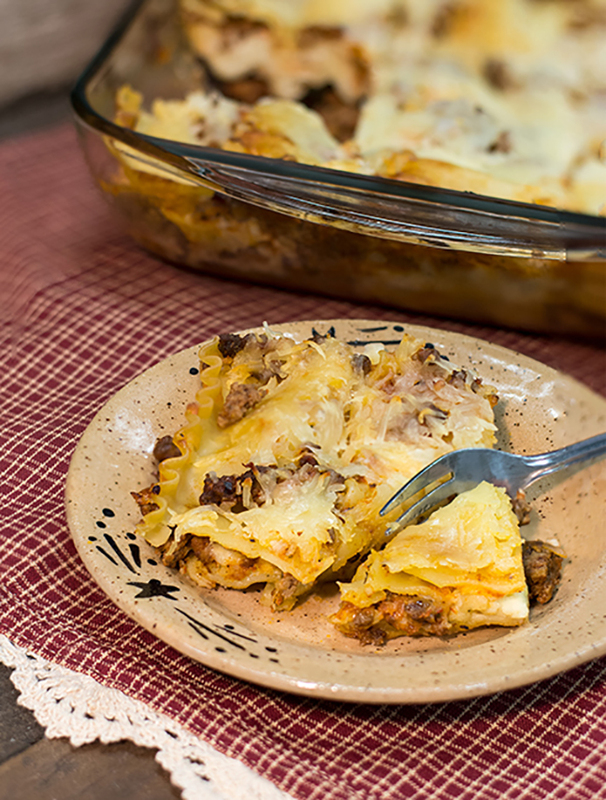 Honestly, this was the easiest lasagna recipe I have ever made, and I definitely see it making an appearance at dinner again! Look at all that cheesy goodness! Personally, I was a little leery about the cottage cheese. I’m typically not a fan, but oh my goodness! It was so delicious! I had a hard time finding a 32 oz. jar of sauce, so I got the regular 24 oz. I actually ended up using only about half anyway and feel it was a good amount. So if you like it saucy, there’s room for that! I would recommend using 2 lbs. of beef. I split the recipe between two smaller pans (one to bring to work and one to keep at home). And even then 1 lb, just wasn’t enough to go around. So I can imagine it might be pretty thin using 1 lb. in a 13″ by 9″ baking pan. One thing that I usually struggle with is the baking times. I am always nervous, I blame a previous stove that always cooked things on the outside super fast, leaving the inside uncooked. But these times were perfect! (cheese)Cake is the answer, who cares what the question is! What’s a fancy feast with a delicious dessert?! 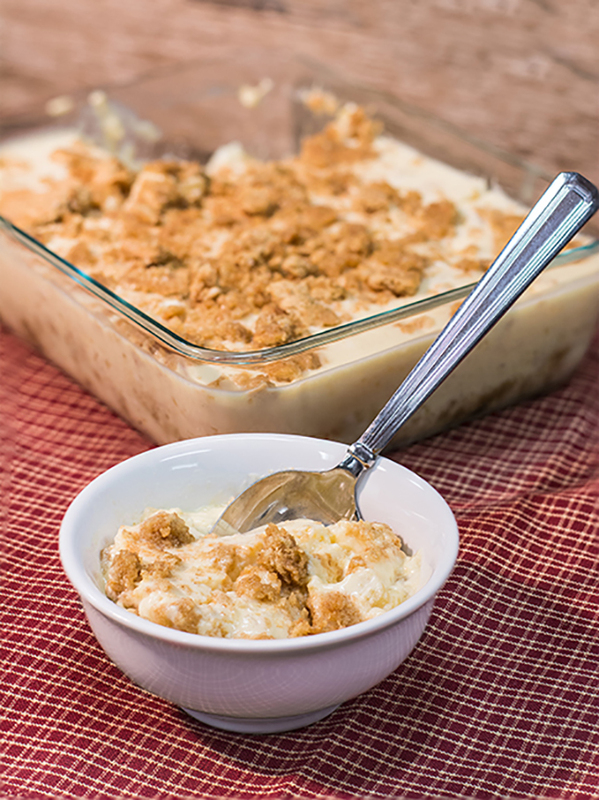 For National Cheesecake Day, I wanted to try a recipe that wasn’t your typical cheesecake but that would still be easy to do. The Tasty Fall Cooking cookbook came through with an intriguing one. 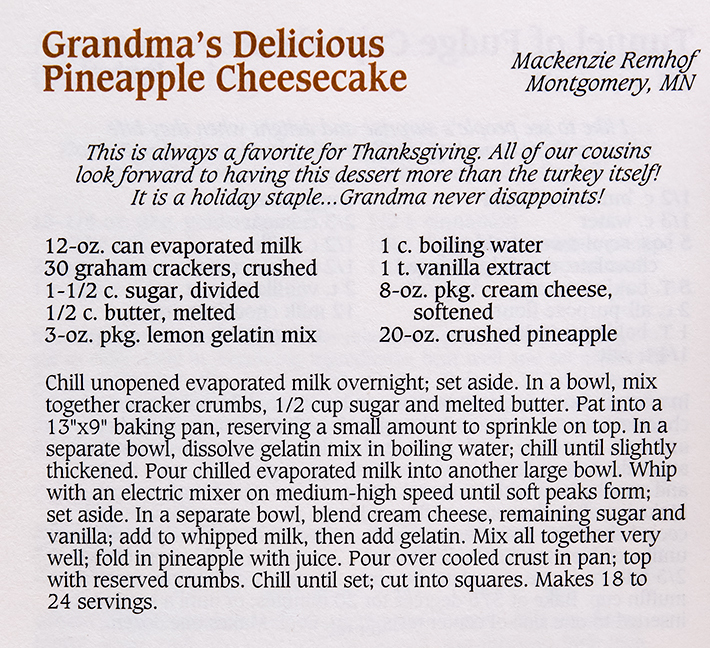 Grandma’s Delicious Pineapple Cheesecake is, literally, the best cheesecake I have had. I just love pineapple! You guys, this was another huge hit! My husband, eh, he was a little unsure. I forgot to tell him it had actual pineapple bits in it, so that caught him off guard and I think threw off the experience! Everyone at work loved it! I didn’t realize prior to picking this recipe that it wanted me to chill the milk overnight. So that didn’t happen. The cheesecake wasn’t as firm as your typical cake; it came out little more “custard-like.” Not sure what I did wrong there! I will say that I almost let the gelatin get too thick when I was letting it chill prior to mixing it with everything else. My little helper had me playing “bouncy-bouncy” and peek-a-boo, so I lost track of time. I didn’t crush the graham crackers enough so the bottom layer had some big chunks in it. So CRUSH, CRUSH, CRUSH. When I try this again, I will be sure to chill the evaporated milk and see if that makes any kind of difference! Also, curious if I should have prepared the jello per packet directions vs. the recipe. Meaning the recipe had you boil it and then chill. The packet wanted you to add another cup of cold water and then chill. A note of “prepare gelatin per the packet directions and then…” would have been excellent. I think it would be super cute to garnish with pineapple tidbits vs. graham cracker crumbles! Or maybe even both! I couldn’t stop thinking about one of my favorite shows, The Golden Girls, while I was making this. They taught me you can solve anything with friends and cheesecake! You are all set to celebrate National Lasagna Day and National Cheesecake Day with these easy recipes! Let me know if you decide to make either of these and how it turns out! And if you are looking for more great cookbooks, check out our collection here. Sounds yummy and I bet Bella was excited to help! Yes! She just loves being in the mix of everything, haha! Looks Delish! I’m going to try the Lasagna! Yum! I’m more of a chocolate gal! You are going to love it Christy! Hmmm, I will try to do something with chocolate soon and share it!